Vessel Sinks Are Everywhere. Should They Be In Your Bathroom? Glass Vessel Sink: Impractical, But Fun and Showy. You're not going to install a vessel sink in a kid's bathroom, that's for certain. But you might put one in a powder room. Vessel sinks are pure luxury, 100% indulgence: they go in places like powder rooms, where you may want to show off a bit, or in your personal space, the master bath. Now, we all know that one person's pleasure is another person's vice, so not all people love vessel sinks. Some homeowners consider them garish, gimmicky, and trendy. As if that wasn't enough, these same people say that vessel sinks are simply not practical. They add a smidgen extra counter space. They look cool when full of water--glass vessel sinks, anyway. Perfect segue to this pictured product. This is a frosted glass vessel sink, simple and budget-minded. It's what we call an above-counter or on-the-counter vessel sink because it rests entirely atop the bathroom counter (as opposed to a recessed vessel sink which is partially sunk into the counter). But why would you want a frosted glass vessel sink? Isn't the point of this whole exercise to show off your sink? And the best way to do that is with a clear glass vessel sink. Nothing is cooler looking than a clear glass vessel sink half-filled with water with the faucet running. Trust me. It feels like you're living in a Kohler commercial. Opponents of clear glass vessel sinks (boo hiss) say that the clear material shows off soap scum and scratches. Do we care about them? Nah. I say, "Live for today, clear glass all the way!" As a compromise, you might choose a broken clear glass sink. This attractive crackle effect, while still clear, does a better job of hiding imperfections in both your sink surface and your housekeeping habits. 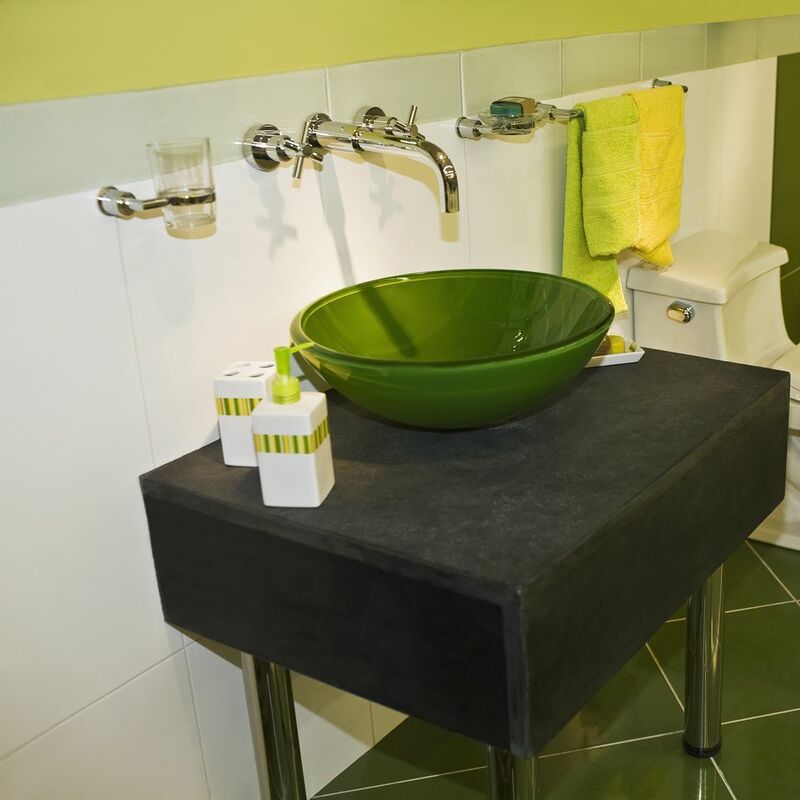 Shown here is the Kraus GV-500-14 - 14" Broken Clear Glass Vessel Sink with Green Tint. Why stop at clear and frosted glass vessel sinks? Sink manufacturers can just as easily produce colored glass vessel sinks--deep reds, blues, greens, and you-name-it--for about the same price as the clear and frosted versions. Shown here is a Ronbow navy-blue two-layer glass vessel sink, 15-3/4" diameter. Must all vessel sinks be glass? Hardly. When you enter the arena of white vessel sinks, everything looks different all of a sudden. No longer are you dealing with issues of soap scum visibility and surface imperfections on the basin. You have a greater range of household cleaners available to you (less worries about scratching). Not only that, white vessel sinks just look a whole lot different. The glass basins are contemporary and even a bit daring; white vessel sinks look traditional and classic, almost like the pitchers and basins used by people hundreds of years ago. The white vessels look great on dark wood vanities and granite countertops, too. Shown here is a St. Thomas White Vessel Sink, 16 3/8" diameter. The faucet installation coming out of the wall is not mandatory. You could also have the faucets extending vertically from the granite countertop, though you'll want to make sure that the faucet reaches high enough to clear the sink basin lip. I include this product for a very good reason. You may not think so, but this is a square vessel sink. In a marketplace where most vessel sinks are round or oval and made of either frosted or clear glass, this square vessel sink is unique because it blurs the line between vessel and drop-in sinks. Looks like a drop-in sink that's jutting up a little too much (2 3/4", if you want to be exact about it). And even has handles and faucet extending through the sink rim. So, in many ways it's almost like a drop-in sink. Except for the fact that it's not. It's still classified as a vessel sink.